This time of year really is glorious. After a long winter, nature is flourishing, the trees are luscious, the flowers are in full bloom and the wild garlic is in abundance! You can usually smell it before you see it but it tends to grow in big patches in woodland areas and by streams. I’ve found two particularly good spots on the grounds of both Drum and Crathes Castles in Banchory, so if you are local you can guarantee each year to find it there. 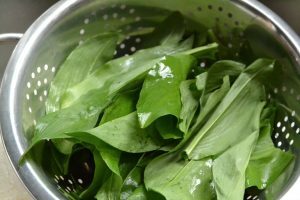 Its large green leaves are the bit you want, but the flowers are out at this time too and they can also be eaten or simply added to your dishes for decoration. 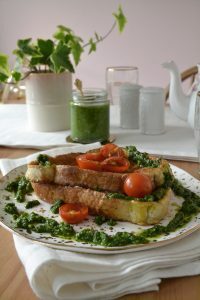 This pesto is so versatile and is great with pasta, added to salads, in a sandwich or drizzled over french toast – a favourite of mines which I’ve shared the recipe for below too! 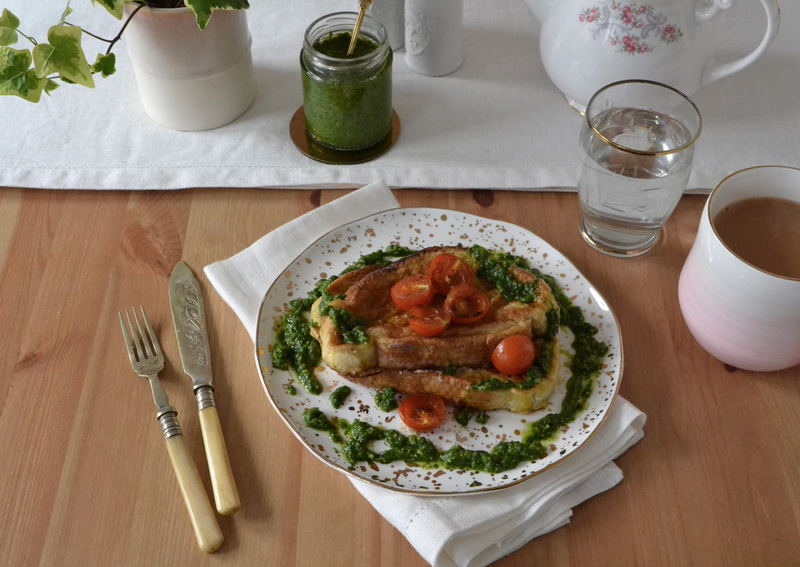 This recipe makes two slices as one large portion, so just double up as required! Step 1. 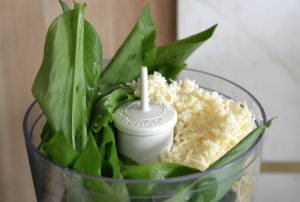 Wash your wild garlic thoroughly, then dry in a salad spinner or with a dish towel. Place it into a food processor along with the hazelnuts, grated cheese and salt then give it a quick blitz to break everything down a little. Step 2. 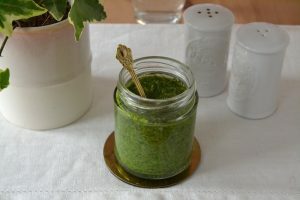 Add the olive oil and blend until everything is well combined and resembles pesto. 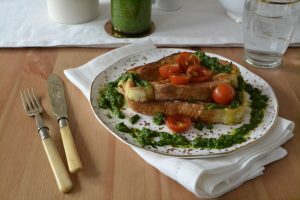 Store in a jar in the fridge, for brunch continue the recipe below! Step 3. 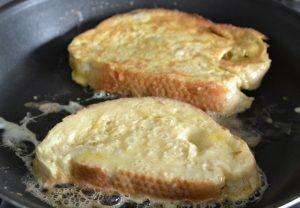 In a large frying pan place the spoonful of butter on a medium heat and leave to melt. Crack the eggs into a shallow dish and add the milk, salt and pepper. Give it a good mix with a fork until the mixture is smooth then carefully place the bread into the mixture, letting it soak in before flipping it round to soak in the other side too. 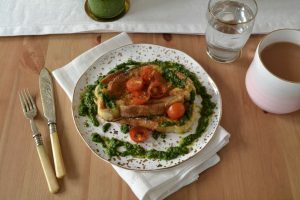 Use a spatula to remove the soaked bread and place straight into the heated pan, then turn up the heat to high and repeat with the second slice. 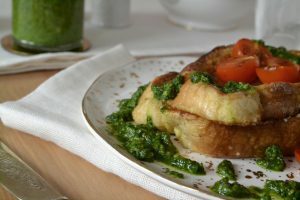 As the toast is cooking away, place the tomato halves in a separate pan on a medium heat with no oil, mixing occasionally to ensure they don’t burn. This will cook them nicely. Step 4. When the toast has browned on each side it is ready. 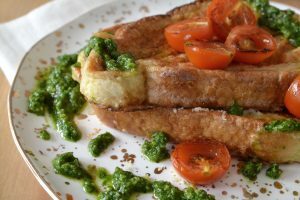 Remove it from the heat and place one slice on the serving plate, add the grated cheese on top then place the second slice of toast on top again which will melt the cheese filling to perfection. 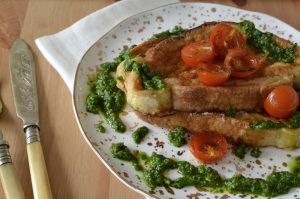 Add your tomatoes on top then finish with a generous drizzle of freshly made wild garlic pesto. Brunch is served!